Critical Social Justice (CSJ): Rise began outside the confines of a lecture hall last week, bringing the mission directly to the streets of UMBC. 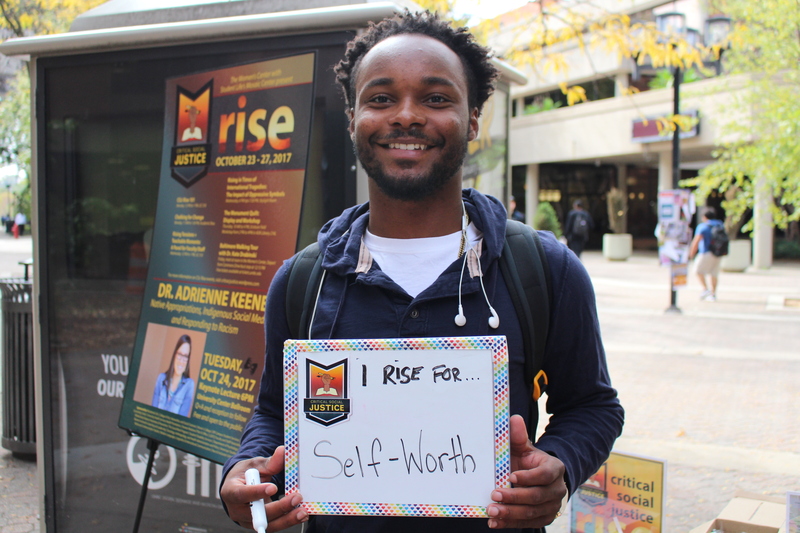 During the kickoff event, Chalking for Change, students answered the question “What do you rise for?” with familiar words – equality, inclusion, respect, tolerance, and other personal credos – that told a visual story of empowerment spanning Academic Row. Now in its fifth year, CSJ is designed to encourage the public to think more closely about Critical Social Justice. Sponsored by the Women’s Center, The Mosaic Center for Culture and Diversity, and 18 additional co-sponsors, the week-long series offers a range of opportunities to explore individual and collaborative instances of resistance and resilience. CSJ participant sharing what he rises for during Chalking for Change. One of the most compelling events of the week was speaker Adrienne Keene’s keynote lecture, “Native Appropriations, Indigenous Social Media, and Responding to Racism.” Keene opened her dynamic speech by displaying the results of a web image search for the term “Native American.” The search yielded repetitive images of historic photos or paintings that predominantly featured men bedecked in war regalia. “There are 567 different federally recognized tribes and hundreds more state-recognized and non-federally recognized tribes, and each of those tribes has their own culture, their own regalia, their own language, their own history, their own government and that vast diversity and complexity is nowhere in this set of images,” Keene said in reference to the largely uniform results. During CSJ, The Women’s Center also invited survivors and secondary survivors to a quilt making workshop to create pieces for addition to the Monument Quilt, a public demonstration of stories from sexual violence survivors and their loved ones and supporters. The ultimate goal of the Monument Quilt is to blanket the National Mall with 6,000 squares that will spell out “Not Alone.” Moderators also used this time to address the #MeToo movement on social media, and gave many individuals the opportunity to speak about it in person for the first time. The week culminated in the annual Baltimore Walking Tour with Kate Drabinski, senior lecturer in gender and women’s studies. Participants started their walk at the corner of Martin Luther King Boulevard and Pratt Street and continued to the Inner Harbor, stopping at various sites of resistance and resilience along the way. The tour focused heavily on transit and the effects it has on shaping communities. To learn more about Critical Social Justice, visit the Critical Social Justice blog. Banner image: Members of the UMBC community share their input during a workshop facilitated by Adrienne Keene. Photo by Marlayna Demond ’11 for UMBC. Additional photos provided by UMBC Women’s Center.